Roy Prentice, who suffers from Dementia, was offered the opportunity by club to score a goal at the club’s home ground. 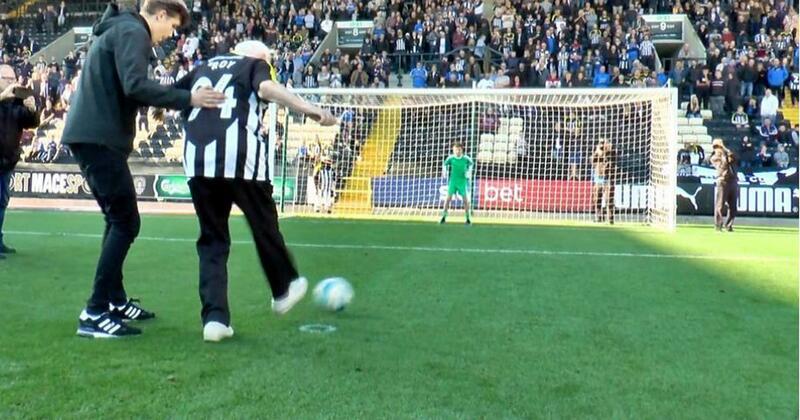 England’s Football League Two side Notts County FC provided an opportunity for a 94-year-old fan, suffering from Dementia, to score a goal in front of the fans at the club’s home ground Meadow Lane. A spokesperson for the club is quoted as saying by BBC Sport that Roy Prentice, from Chilwell, was a “massive County supporter” who wanted to score a goal in front of Meadow Lane’s Kop end before he died. During the half time in the league fixture against Crewe Alexandra on Saturday, Prentice got to walk out on to the pitch wearing a Notts County jersey with the No 94 printed on it below his name. With the ball crossing the line after he took a penalty, the fans cheer him on as his knees got a little weak.